It's that cute, classic retro style (I love the curved back and the crisscross caning!! ), in a funky darkish stain with little black speckles--you know the finish. I was not in love. I got out the yellow spray paint and taped off the white parts. 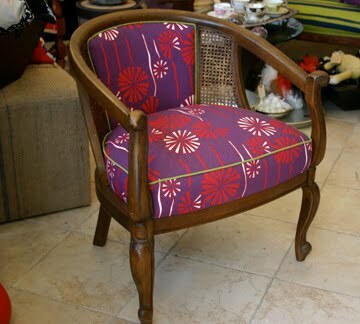 I spray-painted the fabric lightly, just to brighten it!! I really like it, actually! The coat of spray paint is so light that it sort of absorbed into the fabric and it's not scratchy or anything. Have any of you ever spray-painted fabric? With how much success? 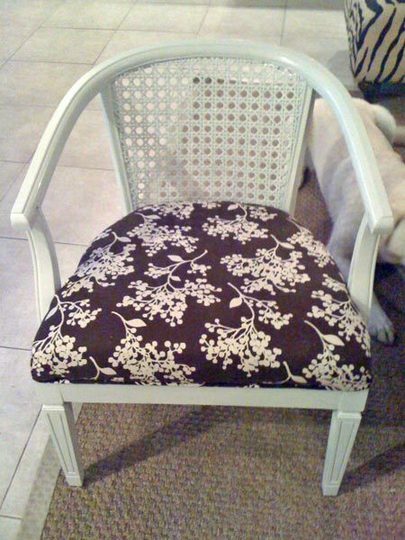 I am in the process of reupholstering a chair now, and you are so correct when you say it is alot of work. This looks great, though. As long as it functions as well as it looks, it seems like a good option. Does it feel rough to touch? Cool! Reupholstering isn't always a lot of work, but actual upholstery, with all the edges hidden neatly under the piping, can be hard. No, it's not too scratchy to touch. Wow! I would have never thought to spray paint fabric. It looks great! 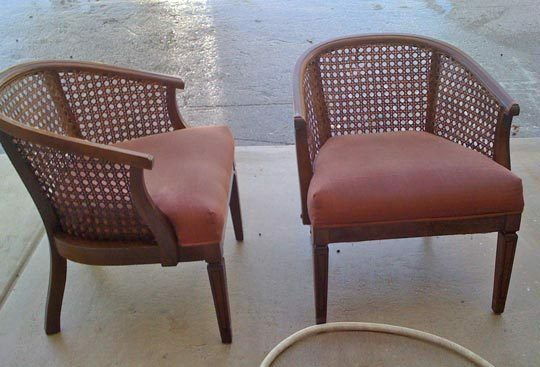 I just refinished a set of chairs, but the seats were removable, so the reupholstering part was easy. 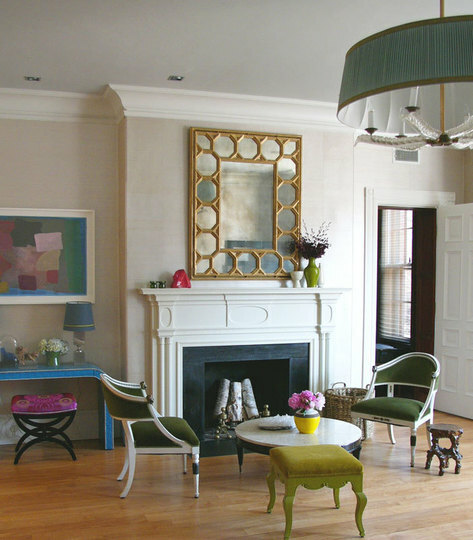 BTW, I think that source unknown photo is from the BHG website. fabriquefantastique, I think it's just called a club chair, with the low style and clearly not meant as a dining or desk chair. The caning is the criss-cross stuff on the sides. I see similar ones at thrift stores fairly often, good luck! I would never have thought to paint the fabric. Fabulous outcome! That looks great! Nobody will probably know that you revived it with spray paint. Great transformation. I've seen the spray paint for fabric but have never tried it. Great makeover! 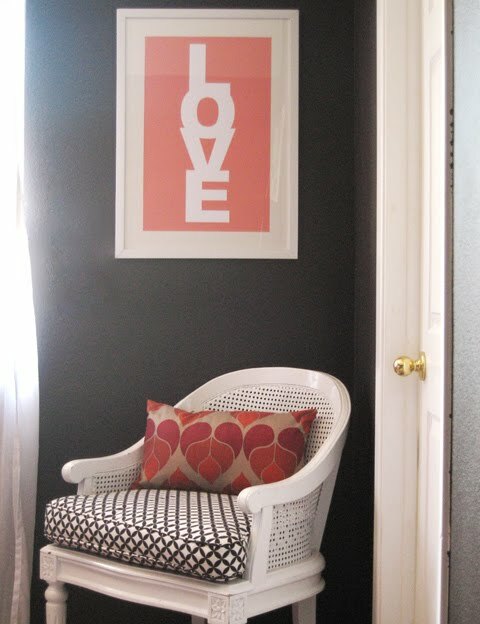 If you DO descide to re-upholster it, I just love the white and pink florals...very cute! Very cute! 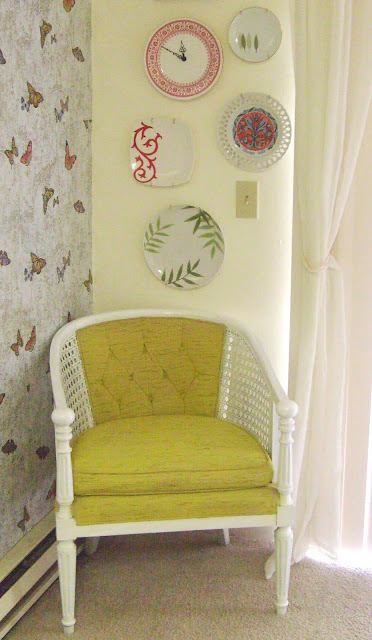 I love the plates that are hanging on the wall, especially the one that has been turned into a clock. I once used fabric paint on a couch. It had teeny-tiny pink flowers, which I painted gold. It took a while, but it looked much better. And it didn't look or feel strange. I think if you only paid $5 for it, it doesn't hurt to give it a try! Yours turned out great. I'm wondering about Lot's question too. But I think that the chair is adorable, and your fix up job is great. There is a fabric dye spraypaint, we used it to 'distress' fabric and costumes for operas and theatre. I don't know where you can buy it these days though. And upholstery isn't that hard - especially if you are a decent seamstress, and I think we know the answer to that question where you are concerned! Well, @Lot and @The Dreamstress, no, they don't get yellow!! I used regular spray paint, from the cheap brand at Lowe's. Just plain ol' permanent spray paint. It is on there for good as soon as it dries!! I imagine I could have used fabric spray paint but I might be worried with that about it fading. I've never used it before. 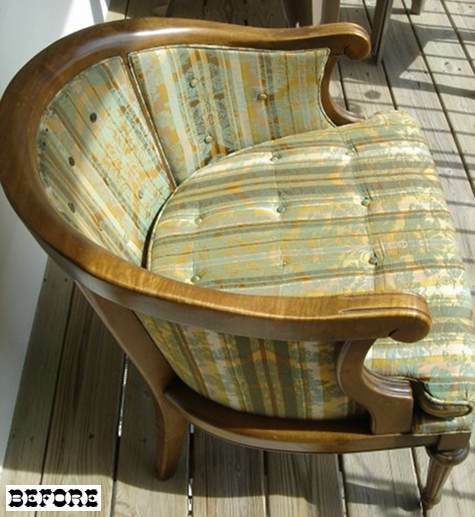 I've seen the designers on Trading Spaces (Hilde)spray cloth furniture. And you can buy fabric spray paint too. PLUS you can even buy special Leather Dye spray paint. I doubt regular spray paint would rub off, unless heavily applied. But I would definately be very careful about washing it unless the paint was 100% acrylic. Water and latex are not friends. Thanks for sharing the inspiring pics! I recently moved and am looking for some extra seating in my living room. 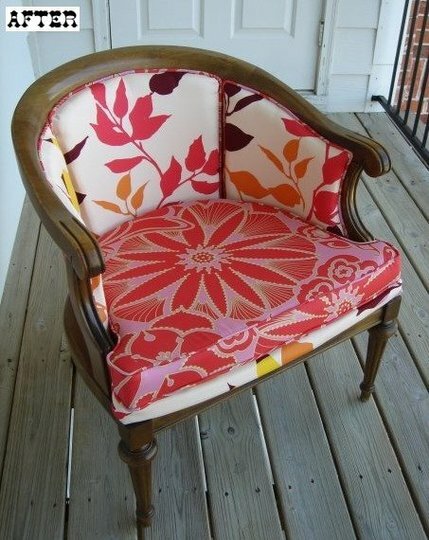 I'll definitely have to keep an eye out for some chairs like this :) Way to be brave with the spray paint - I've seen others post about spray painting upholstery, like Jenny at Little Green Notebook. Methinks you're onto something!